The one exception to this pattern is the views of blacks and whites. While the Sept. 11 attacks easily top the list for whites, it shares the top spot with the election of President Barack Obama among blacks. 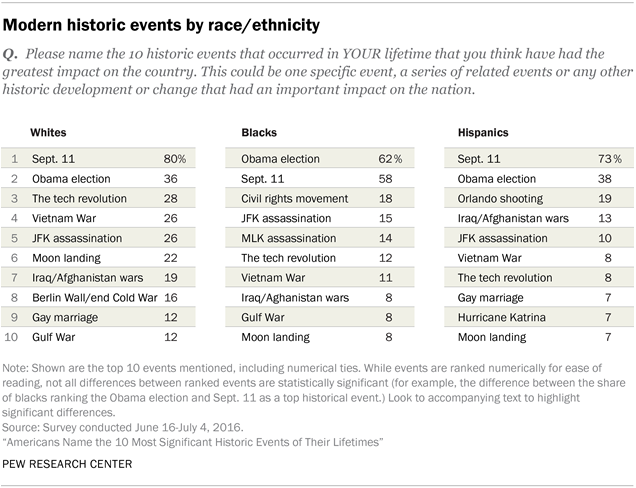 Similarly, the civil rights movement ranks behind only the election of Obama and 9/11 on the list of most significant events for blacks but is absent from the top 10 lifetime events for whites. Just as striking as the public’s consensus on the impact of 9/11 is the steep drop-off in the proportion of Americans who name other notable events. The election of Obama is the second-most frequently named event, listed by 40% of the public. Every other event is named by fewer than one-quarter of all adults. This includes the changes ushered in by the internet, personal computers, smartphones and other innovations of the tech revolution, the assassination of John F. Kennedy, and the Vietnam War. 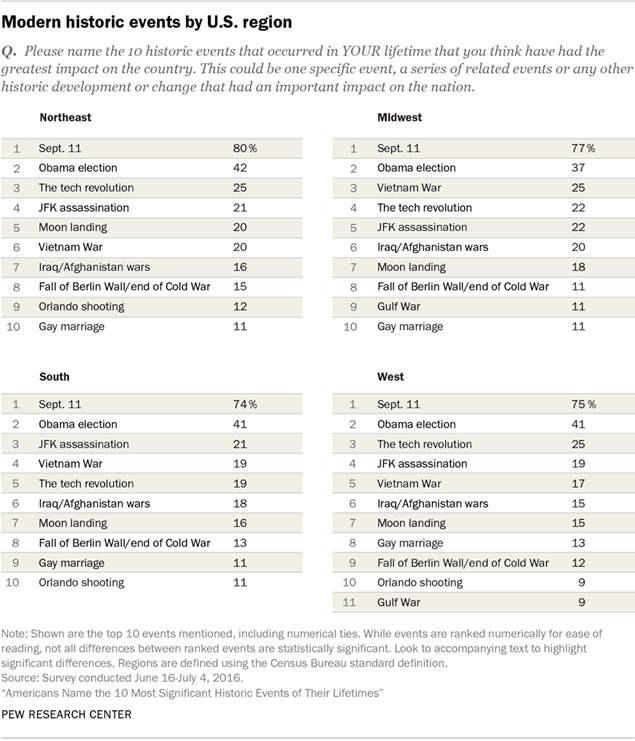 To measure how Americans view the importance of recent historic events, Pew Research Center conducted a national, probability-based survey with a representative sample of adults who are members of the GfK KnowledgePanel, a national, probability-based online panel. 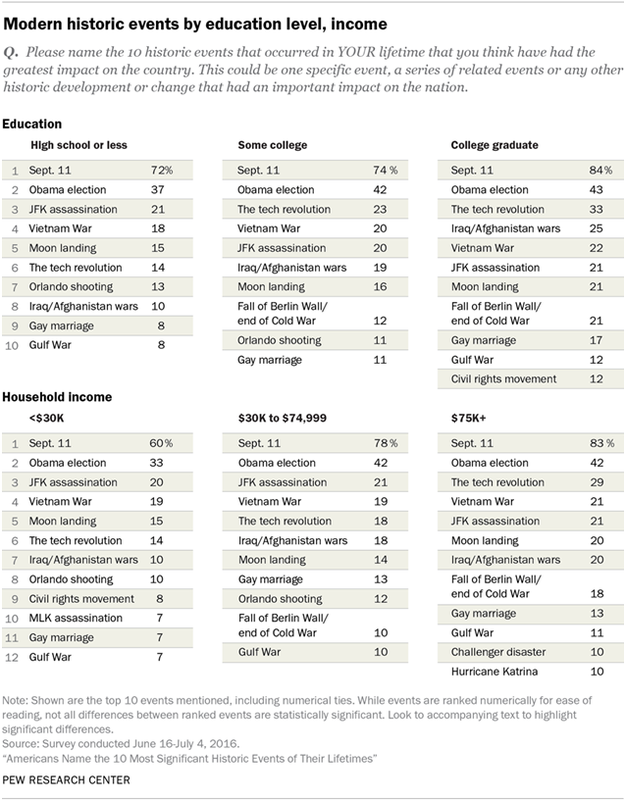 Pew Research Center received supplemental funding from HISTORY to conduct this survey. Survey participants were asked to list the 10 historic events that occurred during their lifetimes that they thought “have had the greatest impact on the country.” Respondents were further told that they could name a specific event, a series of related events or any other historic development that had a major influence on American life. The survey finds that Americans are primarily bound together by their generation and the major events that occurred during their formative years. For the oldest Americans, the Silent and Greatest generations, that unifying event is World War II. For Baby Boomers, the assassination of John F. Kennedy and the Vietnam War are defining moments. For Millennials and Gen Xers, the 9/11 terror attacks and the Obama election leads the list by a greater margin than for other generations. The top 10 list for these young Americans also varies from the rankings of other generations. For example, the Columbine school shooting makes the top 10 list of Millennials and Gen Xers but not Boomers or the Silent Generation. Millennials also are unique in that five of their top 10 events – the Sandy Hook and Orlando/Pulse nightclub shootings, the death of Osama bin Laden, the Boston Marathon bombing and the Great Recession – appear in no other generation’s top 10 list. The public’s responses to two other survey questions are even more varied. When asked to name the historic event that made them feel the proudest of their country, the country’s collective response to Sept. 11 led the list, although it is only named by 19% of adults. The Obama election finishes a distant second with 14%, while the moon landing, the killing of bin Laden and the legalization of gay marriage receive single-digit support. At the same time, the Obama presidency and the presidential campaign of Republican Donald Trump top the rankings of events that most disappoint the country (about one in ten named each), views that are clearly associated with the partisan leanings of respondents. The remainder of this report explores these results in more detail. The first sections report the similarities and differences in the rankings by generation, race and ethnicity, gender, income, education, political party and region of the country. The following sections examine events Americans consider the most significant to the country and to them personally, and which occurrence makes them the proudest and most disappointed in their country. Since the survey question asks respondents to name events that occurred during their lifetimes, a number of these results are highly age-specific and should be interpreted in that light. Younger adults – Millennials and Gen Xers – have experienced fewer historic events simply because they have not lived as long as Baby Boomers or members of the Silent Generation. In other words, the fact that younger Americans don’t list World War II doesn’t mean they believe the Second World War is not a historically important event, it just means it was not an event that occurred in their lifetime. Like people, generations have distinctive identities that are linked, in part, to singular events that occurred during their members’ formative years. For the oldest Americans, the Silent and Greatest generations,1 that unifying event is World War II. These men and women name the Second World War (44%) near the top of their list of important events, behind only 9/11 (59%). Similarly, the assassination of John F. Kennedy, the Vietnam War and the Apollo 11 moon landing stand out on Baby Boomers’ list of major historic events that occurred in their lifetimes. Fully 45% of Boomers list the Kennedy assassination as one of their top 10 events, while nearly as many (41%) name the Vietnam War and about a third (35%) name the moon landing (events that also appear on the Silent Generation’s top 10 list). While much of the historic record remains largely to be written for the Millennials and Generation X, two singular historic events already stand out at the top of their lists: Sept. 11 and the election of Barack Obama, the first black president. These younger generations are unique in the high level of consensus of their rankings. Fully 86% of Millennials list 9/11 as a significant event in their lifetimes and 47% name the Obama presidency. Likewise, 79% of Gen Xers name Sept. 11 at the top of their list, while 40% list Obama’s election. Among older generations, a larger selection of historic events garners mention by more than a quarter of their members. The generations differ primarily in the relative importance they place on Sept. 11 compared with the Obama presidency. The Sept. 11 terrorist attacks are the single most frequently mentioned historic event across all generations. However, the proportions of each generation who share this view differ significantly. For example, almost nine-in-ten Millennials (86%) name the terror attacks as an important historic event, compared with 59% of those in the Silent Generation or older. Obama’s election and presidency finishes as the second-most frequently named historic event among Millennials and Gen Xers (47% and 40%, respectively). By contrast, among members of the Silent Generation, Obama’s election (28%) finishes well behind three other historic events: 9/11 (59%), World War II (44%) and the assassination of John F. Kennedy (41%). Millennials have entered into the stream of history relatively recently, and as a result a number of modern events stand out more to them than to their counterparts in other generations. The wars in Iraq and Afghanistan make the top 10 list of Millennials (24%) and Gen Xers (18%) but barely make the top rankings of Baby Boomers (11%). The U.S. Supreme Court decision legalizing gay marriage makes the top 10 list of Millennials (19%) but is mentioned significantly less often by Gen Xers (10%), Baby Boomers (7%) and members of the Silent Generation (3%). And the Orlando shooting ranks as one of the top historic events that have occurred in the lives of Millennials (17%, compared with 9% of Gen Xers, 7% of Boomers and 6% of Silents). 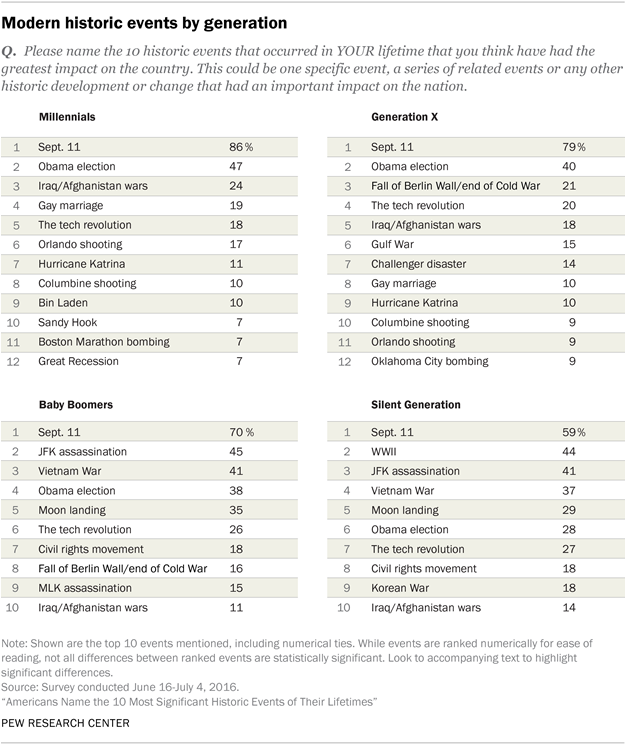 Millennials are also unique in that five of their top 10 events appear in no other generation’s top 10: the Killing of Osama bin Laden (10%), the Sandy Hook school shootings (7%), the Boston Marathon bombing (7%) and the Great Recession (7%). 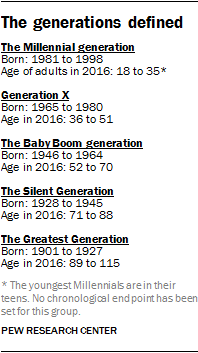 In addition, the Gulf War and the Challenger disaster are only named by Gen X (15% and 14%, respectively), while the Martin Luther King Jr. assassination (15%) appears on only one generation’s list – Baby Boomers. To some extent, these findings are predictable: Young Americans simply have not lived long enough to have experienced the same number of history-making events of older adults. Conversely, some events like World War II could only be experienced by one generation, and other events like the Korean War occurred during another generation’s formative years. Just four events appear on the top 10 lists of all four generations: Sept. 11, the Obama election, the wars in Iraq/Afghanistan and the tech revolution. Not surprisingly, events related to the black struggle for equal rights also have particular relevance to black Americans, though far less so for whites. Among blacks, 18% say the civil rights movement 2 is one of the 10 most significant events to occur during their lifetimes. By contrast, only 8% of whites cite the civil rights movement – and it fails to make their top 10 events list. On six of the eight events that appeared on both lists, significantly smaller proportions of blacks view the event as impactful compared with whites. For example, the tech revolution appears on both top 10 lists and is cited by 28% of whites but only 12% of blacks. Similarly, the Vietnam War is cited by 26% of whites but 11% of blacks. Much like the civil rights movement, the historical significance of the Martin Luther King Jr. assassination is perceived differently by blacks and whites. Some 14% of black respondents name the civil rights leader’s assassination, compared with only 7% of whites. Further, while the MLK assassination ranks fifth for blacks, it fails to make the top 10 list of historic events for whites. Meanwhile, the Orlando/Pulse nightclub shooting ranks relatively high among Hispanics (mentioned by 19%). By contrast, 9% of whites and 7% of blacks say this mass shooting is equally momentous. While these data cannot explain why Latinos disproportionately see the Orlando/Pulse mass shooting as historically significant, the circumstances of the attack provide some clues. The attack occurred on the night that Pulse, a popular nightclub, was hosting a “Latin Night” celebration, and counts immediately after the tragedy indicate that 90% of the 49 murder victims were Latino. Also, the shooting victims were predominantly young, and Hispanics as a group are disproportionately young relative to the white and black populations. The events in American history named by Republicans and Democrats overlap substantially, and differences between the two parties are primarily a matter of degree. 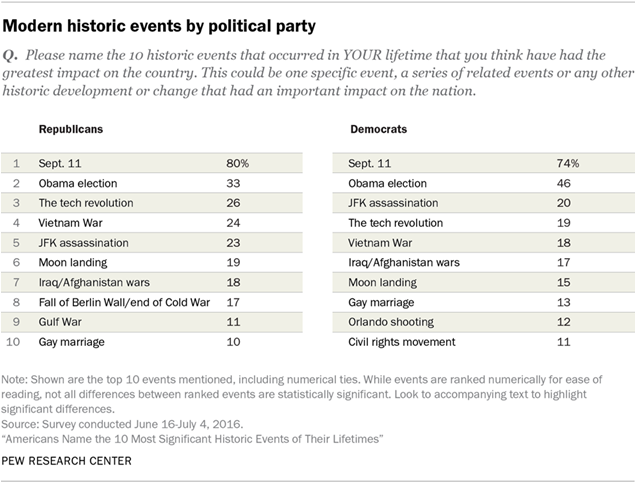 Large majorities of both Republicans (80%) and Democrats (74%) name Sept. 11 as a significant event in their lifetimes. While both parties name the election of Obama as president the second-most often, Democrats are somewhat more likely than Republicans to cite this event (46% vs. 33%). 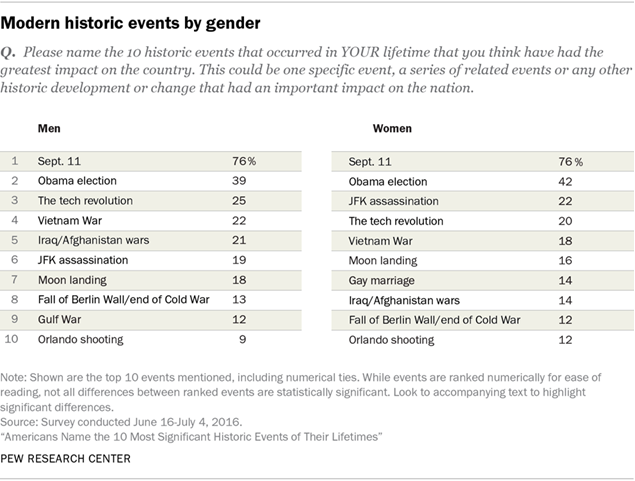 When it comes to evaluating recent American history, the new survey data suggest there is little to no gender gap in the way men and women rank the events that shape their times. As is true across generations, Sept. 11 stands out by far as the most impactful event among both men and women, with Obama’s election following as a distant second. Other events are clustered in roughly similar patterns among both sexes, and include the tech revolution, the Vietnam War and the moon landing. These events are named by between 15% and 25% of both male and female respondents. In terms of differences, the recent wars in Iraq and Afghanistan rank higher among men (fifth, at 21%) than among women (eighth at 14%). The Gulf War that took place during the George H.W. Bush administration is named by 12% of men and 8% of women. Women are slightly more likely to name gay marriage (14% do, compared with 8% of men). Americans living in various parts of the U.S. think remarkably alike about the historic events that have had the greatest impact on the country. 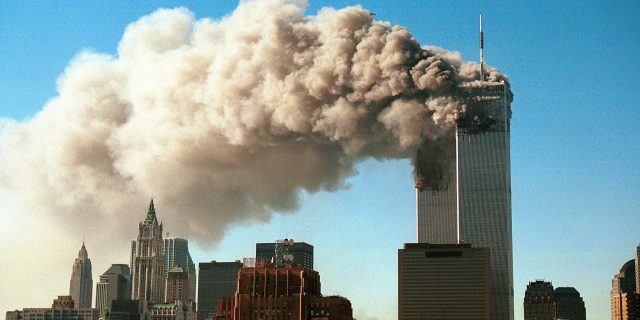 Sept. 11 tops each regional list by a large margin, from the attacks’ geographical centers of New York City and outside Washington, D.C., to the West Coast. Fully 80% in the Northeast name the terrorist attacks, as do 77% of those in the Midwest, 75% in the West and 74% in the South. As has been true across various demographic breaks, the election of Barack Obama as commander in chief ranks a clear but distant second. The differences from there are limited and subtle; in fact, the percentages for a given event rarely differ between regions by more than 5 points. Across education and income levels, Americans are consistent in the events they name as historic, with a few notable variations. As is true across many other demographic breaks, Sept. 11 tops the list of responses in each education level by a wide margin, followed by the election of President Barack Obama. While the tech revolution makes the top 10 list of respondents in each education level, those with at least some college experience are more likely to cite these advancements than those with a high school diploma or less. A third of those with a college degree and 23% of those with some college experience name the tech revolution, compared with 14% of those with a high school diploma or less. The same pattern occurs across income groups. Americans were also invited to weigh in on the times and events that made them most proud of their country, and those that left them feeling most disappointed. Perhaps the most significant finding is that there is much less agreement on this front than when it comes to naming events that are historically important, in that no one answer is named by more than a quarter of the public. To the extent that Americans coalesce upon a point of pride, it is the nation’s response to 9/11, including mentions of the bravery of first responders, the outpouring of genuine sympathy for victims or the way the country united after the terrorist attacks. Overall, 19% cite this as the moment they felt most proud of America. The election of Barack Obama ranks second, named by 14% as one of the country’s finest moments. Yet nearly as large a share of the public (11%) see his election or presidency as their biggest disappointment. Right there with Obama at the top of the disappointments list is the Republican primary election campaign that led to the nomination of Donald Trump, cited by 10% of respondents (note, the survey was fielded in the summer of 2016). There are key differences by race and by party identification in some of these responses. Fully 45% of black Americans say they were proudest of their country after Obama’s election, more than five times the share of whites (8%) and more than triple the proportion of Hispanics (12%) who share that view. Democrats are also significantly more likely than Republicans to cite Obama’s election as their proudest moment (23% vs. 3%), a difference only partially explained by the disproportionately large share of blacks who identify with the Democratic Party. Meanwhile, Republicans (32%) are significantly more likely than Democrats (17%) to say the response to 9/11 is the time in their lives when they felt the proudest of the country. And a significantly larger share of Republicans (23%) than Democrats (2%) rate Obama’s election and presidency as the most disappointing event in their lifetimes.